I believe the most likely application is in the discovery and development of new therapies. That is, I believe that the greatest impact will come when precision medicine strategies are incorporated into the very beginning of drug discovery, and will only rarely have an impact on therapies that were not developed with precision medicine in mind from the start. Moreover, I believe that one day, application of precision medicine will radically reduce the cycle time from an idea to clinical proof-of-concept. This day will come once we are able to rapidly program therapeutics that correct a precise molecular defect – and test therapeutic hypotheses in humans within months (not years!) of generating a therapeutic hypothesis. This is what is really needed to change the trajectory of drug R&D. Unfortunately, that day is a long-ways off, which means that today the path for precision medicine is very long and very inconvenient. Here is what I mean (see Keynote slide deck here, Powerpoint here from my National Academy presentation). The fundamental challenges faced by drug R&D are (1) high failure rate in Phase 2/3, which leads to high overall cost of drug R&D (due to the cost of the failures, not the cost of the successes), and (2) inability of new therapies to differentiate from standard of care. A consequence is that most new therapies fail to lower cost of delivering high quality health care to patients in need. To change the trajectory of drug R&D, the industry needs more than incremental change. Sure, it would be useful to compress timelines in early or late development by 10%. Sure, it would be valuable to find 1 out of 20 drugs that appears to have a pharmacogenetics effect that improves positive predictive value that a drug is safe or effective by 20%. But such incremental changes will not likely have a disruptive effect on (1) high failures rates in Phase 2/3, or (2) cycle time to progress from new target to a clinical proof-of-concept (PoC) clinical trial. We need to triple the success rate in Phase 2/3 trials. And we need to cut by a factor of 10 the cycle time to generate and test therapeutic hypothesis in small PoC clinical trials. To change the trajectory of drug R&D, we need at least two areas of improvement: (1) sound biological hypotheses based on causal human biology, and (2) programmable therapeutics that enable therapeutic hypotheses to be tested quickly, efficiently and safely in humans. 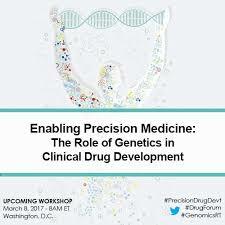 Human genetics and other molecular tools that define precise patient populations can help with the former. A recent example of human genetics for new drug targets is illustrated by the recent JAMA paper by Sek Kathiresan and collages (see here). But new therapeutic modalities are needed for the latter. This is an inconvenient path. The example of gene therapy for sickle cell anemia published last week in NEJM provides an example of how long it can take from understanding a molecular defect to designing an effective therapy (see blog here). Other examples include the recent approval of an oligonucleotide therapy, nusinersen (Spinraza), for spinal muscular atrophy and small molecules, ivacaftor (Kalydeco) and lumacaftor (Orkambi), for cystic fibrosis (see YouTube video of talk by David Althsuler, CSO of Vertex, here). These examples emphasize that today, it takes more time – not less – to incorporate precision medicine into the design of effective therapies. Fortunately, there are disease areas that are very well suited for a precision medicine approach to drug discovery and development. Rare diseases such as sickle cell anemia, spinal muscular atrophy and cystic fibrosis are perfectly suited for a precision medicine drug design approach. Oncology is well positioned, too, as there are now many examples on somatic alterations that can be targeted by specific therapies, including therapies that unleash the human immune system on cancer. I believe the time is also right for disease areas such as autoimmunity and inflammation, as there is a strong genetic basis to these disease, there are approved therapies that can be used as experimental probes to define resistance signatures, and there are other molecular tools (e.g., B & T cell clonal responses to autoantigens) to define unique patient populations. Thus, I believe precision medicine will have the greatest impact when molecular insights are incorporated into the design of new therapies at the very beginning of drug discovery and development. The metrics of success will be 10-fold faster cycle times from idea generation to clinical PoC in humans (months, not years) and three-fold higher success rates in Phase 2/3 trials. While we are a long way from reducing cycling times 10x, this should be our goal.